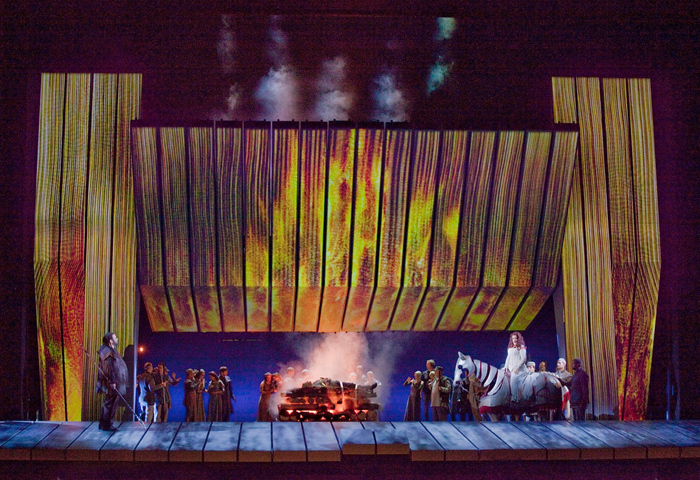 Just back from the HD broadcast of the Met’s Götterdãmmerung. Musically, I was really quite impressed. I thought Luisi’s take on the score was original, valid and enjoyable. His tempi were generally quite quick and there was a taut, sinewy quality to the strings that really brought out the shape of the music. No romantic wallowing here! I really liked the Gibichungs; Wendy Bryn Harmer as Gutrune, Iain Paterson’s Gunther and, especially, Hans-Peter König’s Hagen. All were well sung and characterful. Jay Hunter Morris as Siegfried and Deb Voigt as Brünnhilde were really exciting in the Act 1 love duet and Deb nailed the Immolation scene, almost managing to overcome the staging. So much for the music, what about the production? I went in not expecting much from the production given the caning it had been getting from just about everybody I knew who had seen it. I wasn’t too surprised then when the video director for the broadcast, Gary Halvorson, showed us as little of it as humanly possible. The use of super close-ups was extreme even by MetHD standards and there were some really weird camera angles. Sometimes we were shown a close up from below and to the side of five or six “planks” from the machine. He must have been absolutely desperate. I can see why. There did seem to be an endless procession of scenes where either flowing water or tree like objects were projected onto a basically plain back drop. The one place where I thought the machine worked was in the scenes in the Gibichung Hall where it seemed to reconfigure quite nicely. On the other hand there were a couple of real horrors. Siegfried’s Rhine Journey included a cheesy hollow horse on an all too literal raft floating lamely on an all too literal Rhine. It got worse when the horse reappeared in the crucial Immolation scene. What should be one of the most breathtaking moments in all of opera was reduced to sheer bathos. Deb Voigt was singing her heart out on this horse thing that looked more like it should have been sitting outside a supermarket and which might have been a bit more animated if she had remembered to put a quarter in it. It trundled off into a funeral pyre that looked more like an ad for fake electric log fires before all was obscured by the Machine, covered with the by now all too familiar flame projections. A few cheap looking statues above the Machine crumbled unconvincingly before we reverted to another flat Machine screen things with wavy bits on for the last few bars. There certainly wasn’t a bang and I, for one, was whimpering. I think I’ve learned one thing from Lepage’s production. Even if it had succeeded on its own terms, and I don’t think it did, the production would have been weak. I don’t think it’s possible, in 2012, to do an essentially naturalistic ring with no Konzept. But that’s material for another post. This entry was posted in Performance review - MetHD and tagged bryn harmer, halvorson, hunter-morris, konig, lepage, luisi, methd, paterson, voigt, wagner by operaramblings. Bookmark the permalink. Poor Voigt! I heard she had backed out of some earlier performances due to illness, and it’s unfortunate that now she’s back in form and sounding great she has to deal with distracting/silly staging. At least she didn’t have to cope with a real horse. This is true. It could have been far worse.